Our diets are a moral choice. We can decide what we want to eat, though more often than not we give little thought to our diet and instead rather habitually and instinctively eat foods that have been served to us since a young age. Of course, poverty and isolation can limit our accessibility to choose what we eat. 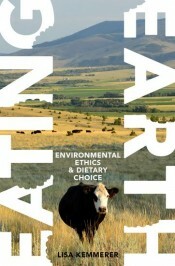 However, as Lisa Kemmerer argues in her book, Eating Earth: Environmental Ethics and Dietary Choice, those individuals who are affluent enough to make conscious decisions about their diets should think twice about the environmental ramifications of their dietary choices—because these ramifications can be drastic. Download a JPEG or PDF version of the infographic. Feature Image Credit: CC0 Public Domain via Pixabay. Lisa Kemmerer is an Associate Professor of philosophy and religions at Montana State University. A graduate of Reed, Harvard, and Glasgow University (Scotland), she holds a PhD in philosophy and is the author of a handful of books, including Animals and World Religions and Eating Earth: Environmental Ethics and Dietary Choice.